Minnesota Rising: Be a Youth Venture "Arts to Venture" Advisor! 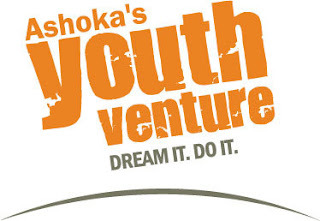 Youth Venture envisions a world where everyone is a changemaker and where that changemaking starts young! Do you support that vision, too? Make your vision a reality - you can serve as an "Arts to Venture" Advisor and support young, artistic entrepreneurs with engaging their creative talents for designing a better world. Details below, and don't forget to check out the Ashoka Twin Cities Solutions Forum tonight! Youth Venture is proud to be working in partnership with Intermedia Arts to present our Arts to Venture program! But, we need your to support Minnesota’s young artistic entrepreneurs in making their ideas a reality. Please consider serving as an Art to Venture Advisor during our inaugural year. Arts to Venture will guide four teams of students through a process of designing and launching an arts venture, providing guidance, seed funding of up to $1,000, how-to’s, and a process for making their idea a reality. Selected teams attend workshops that will help polish arts venture plans and build the skills needed to successfully make positive change in the community. Full program details can be found at http://www.intermediaarts.org/arts-to-venture. A value of our work is to provide as much support to our youth teams as possible, a value we realize in large part through our Advisors. Advisors are adults in any sector who have a strong commitment to supporting the professional and personal development of young people. They are culturally sensitive, have useful skills and networks, and appreciate the role of arts in creating social change. Arts to Venture will have 4, four-hour workshops sessions on Dec. 11th, Jan. 8th, March 19th, and April 26th. They will run from noon – 4:00 p.m. on Saturdays at Intermedia Arts in Uptown Minneapolis. The Community Panel – the opportunity for teams to present and make their pitch for funding - is on Thursday, February 24th in the evening. There will be an Advisor training session on December 11th from 10:00am to noon. Other teams have submitted ideas on using spoken word to address community issues, documenting the stories of the homeless, and creating a marketing campaign to elevate youth voices. If you are willing to be an Advisor for Arts to Venture, please let us know as soon as possible. Just call 612.455.1628 or email smyers@youthventure to speak with Spectra Myers about the opportunity.